Was appointed Cuba’s Minister of Economics in 1960; within months, the Cuban peso was practically worthless. “Well, if he’s dead,” replied Castro. “Then throw him overboard.” In fact Guevara was suffering the combined effects of seasickness and an asthma attack. Evidently, Che was not regarded as an invaluable member of the expedition at the time. As for the rest of Time‘s assertions, other than his competence at murdering bound, gagged and blindfolded men, Che Guevara failed spectacularly at everything he attempted in his life. First he failed as an Argentine medical student. Though he’s widely described as a medical doctor by his hagiographers (Castaneda, Anderson, Taibo, Kalfon) no record exists of Guevara’s medical degree. When Cuban-American researcher Enrique Ros inquired of the Rector of the University of Buenos Aires and the head of its Office of Academic Affairs for copies or proof of said document, Ros was variously told that the records had been misplaced or perhaps stolen. “Those of us who were there can only laugh at this stuff,” say participants on both sides who live in exile today. In fact, the Battle of Santa Clara — despite what those early versions of Jayson Blair reported — was a puerile skirmish. Che Guevara’s own diary mentions that his column suffered exactly one casualty (a soldier known as El Vaquerito) in this ferocious “battle.” Other accounts put the grand total of rebel losses as from three to five men. Most of Batista’s soldiers saw no reason to fight for a crooked, unpopular regime that was clearly doomed. So they didn’t fire a shot, even those on the famous “armored train,” that Guevara supposedly attacked and captured. Gomez was puzzled. “What agreement?” he asked. It turned out, unbeknownst to the troops inside, Guevara had used funds the revolutionaries had raised from anti-Batista Cubans to buy the train and all its armaments from its corrupt commander Colonel Florentino Rossell, who had already fled to Miami. The price was either $350,000 or $1,000,000, depending on the source. They found that in the entire Cuban countryside, in those two years of “ferocious” battles between rebel forces and Batista troops, the total casualties on both sides actually amounted to 182. New Orleans has an annual murder rate double that. The invaders stood their ground to the last man and the militia was forced to probe yet again — and retreat again in headlong flight. They eventually stopped and brought in reinforcements. (50-1 was not enough.) They rained another Soviet artillery storm on the utterly abandoned and hopelessly outnumbered freedom fighters and finally moved in to overwhelm them — after three days of effort in which the invaders hadn’t eaten, drank or slept, and had run out of ammunition. Castro’s forces took 5200 casualties in the process. The freedom fighters suffered 114. Che did show up at the battle site, but the day the shooting ended. He walked into a building strewn with captured and wounded freedom-fighters and looked around with his wry Argentine smile. “We’re going to execute every one of you,” he barked. Then he turned on his heels and walked out. As usual, Castro had a much shrewder plan for the prisoners. His regime reaped a propaganda windfall and 62 million American dollars when JFK ransomed them back. In January 1957, shortly after landing in Cuba aboard the yacht Granma with Fidel and Raul Castro, Che sent a letter to his discarded wife, Hilda Gadea. “Dear vieja (i.e, ‘Ole Lady’ — on top of everything else, Che was also a notorious misogynist) I’m here in Cuba’s hills, alive and thirsting for blood.” His thirst would soon be slaked. The boy was trussed up, shoved in front of a recently dug pit and murdered. Fidel was privy to these events. He thought executing Batista soldiers was incredibly stupid, compared to the propaganda value of releasing them since most weren’t fighting anyway. But he recognized the value of executions in intimidating other Cubans, and recognized Che’s value as someone who enjoyed the job. 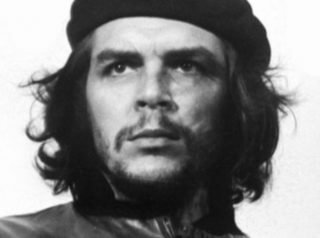 By the summer of 1957 Che Guevara had been promoted to full-fledged Major or “comandante,” the Rebel army’s highest rank. His fame was spreading. Alas, the looting, at first, went in the opposite direction. Castro was no chump like Ulbricht or Gomulka. A French Socialist economist, Rene Dumont, tried advising Castro as the wreckage of Cuba’s economy spiraled out of control. “The Cuban Revolution has gone farther in its first three years than the Chinese in its first ten,” he observed. Hence the mess. A year later the field was weed grown, pot-holed and unusable. The decaying trunks of the formerly fruit-yielding trees were still piled up around the edges of the field even as most Cubans scrambled for fresh fruit on the new black market (under that arch-villain of leftist lore, Batista, Cubans had no need for a black market.) At any rate, it seemed that — the threat of Guanahacabibes or not — Che’s Cuban subjects simply didn’t take to Che’s futbal. Che finally went home, where he found his telephone lines cut. Much evidence points to Che being held in house arrest at this point. And it was under that house arrest that a seriously chastened — and apparently frightened, after all, who better knew the consequences of upsetting the Maximum Leader? — Che composed his famous “Farewell Letter to Fidel,” in which his groveling and fawning was utterly shameless. “I deeply appreciate your lessons and your example … my only fault was not to have had more faith in you since the first moments in the Sierra, not having recognized more quickly your qualities as a leader and a revolutionary. I will take to my new fields of battle the faith that you have inculcated.” and on and on in relentless toadying. “Tatu’s” first military mission was plotting an attack on a garrison guarding a hydroelectric plant in a place called Front Bendela on the Kimbi River in Eastern Congo. Che’s masterstroke was to be an elaborate ambush of the garrison. Tatu himself was stealthily leading his force into position when ambushers became the ambushed. Che lost half his men and barely escaped with his life. In fact, the East German female guerrilla, Tamara Bunke or “Tania” who linked up with Che in Bolivia (they’d met as early as 1961 and were reputedly lovers) was actually a KGB-STASI agent sent to keep an eye on Che. Alas, poor “Tania” ( remember Patty Hearst’s Symbianese Liberation Army moniker?) was mowed down by machine gun fire along with her entire “rearguard” group after a Bolivian peasant relayed their position to the army and helped plan an ambush. Among the unreported idiocies regarding Che’s Bolivian debacle, was how he split his forces into a vanguard and a rearguard in April of 1967, whereupon they got hopelessly lost and bumbled around , half-starved, half-clothed and half-shod, without any contact for 6 months — though they were usually within a mile of each other. They didn’t even have WWII vintage walkie-talkies to communicate. Che’s masterful Guerrilla War, gives no explanation for such a tactic. Kosygin had just come from a meeting with Lyndon Johnson where the U.S. President had laid it on the line, complaining about Castroite subversion in Latin America, and how this was a clear breach of the deal the U.S. and Soviets had cut back in October 1962 that had kept Castro unmolested. Now this mischief in Bolivia might force the U.S. into an agonizing reappraisal of that deal. “No, (the truth at last!) but I have some knowledge of medicine,” answered Guevara, resuming his pathetic attempt to ingratiate himself with his captors.